Cough is the most familiar symptom of respiratory disease, and a problem which general practitioners must deal with on a daily basis. This timely volume draws together a wealth of recent research into the mechanisms, pharmacology and therapies for cough, and places these in clinical context. The text incorporates guidelines on the most common causes of cough, discusses treatments and pitfalls in management, summarizes current research on physiology, pharmacology and treatment of cough, and gives practical advice on diagnosis and management issues for the clinician. 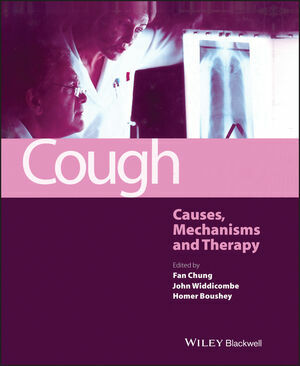 Cough: Causes, Mechanisms and Therapy is the most comprehensive, up-to-date account of the subject. It will update clinical and basic medical scientists, and promote future research. Readers are encouraged to implement the clinical implications of the discussion into routine practice. This volume will appeal to all those involved in the treatment of respiratory disease, particularly those in hospital respiratory units, and will also be of use to interested general practitioners. Fan Chung is Professor of Respiratory Medicine and Head of Experimental Studies Medicine at National Heart & Lung Institute, Imperial College London, and is Consultant Physician at the Royal Brompton & Harefield NHS Trust, London. 1 The clinical and pathophysiological challenge of cough. 3 A brief overview of the mechanisms of cough. Section 2: Cough in the clinic. 4 Clinical assessment of cough. 5 Measurement and assessment of cough. 6 Cough sensitivity: the use of provocation tests. 7 Causes, assessment and measurement of cough in children. 8 The quality of life in coughers Section 3: Clinical conditions with cough. 9 Cough in lower airway infections. 10 Cough in gastro-oesophageal reflux. 11 Cough in postnasal drip, rhinitis and rhinosinusitis. 12 Cough and airway hyperresponsiveness. 13 Cough in chronic obstructive pulmonary disease (COPD). 14 Cough in suppurative airway diseases. 15 Cough in cancer patients. 16 Sensory pathways for the cough reflex. 18 Plasticity of vagal afferent fibres mediating cough. 19 Motor mechanisms and the mechanics of cough. 20 Mucus hypersecretion and mucus clearance in cough. 21 Animal models of cough. 22 Mechanisms of actions of centrally acting antitussives - electrophysiological and neurochemical analysis. 23 Pharmacology of peripherally acting antitussives. 24 Current and potential future antitussive therapies. 25 Placebo effects of antitussive treatments on cough associated with acute upper respiratory tract infection. 26 Mucoactive agents for the treatment of cough.